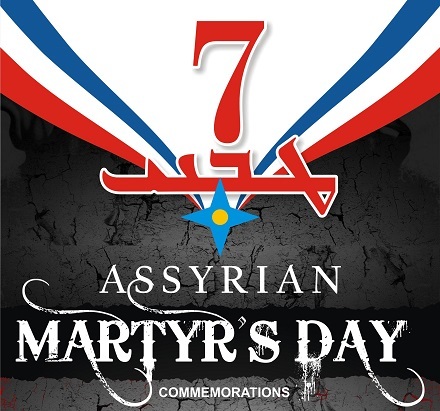 August 7 is Assyrian Martyrs’ Day, in remembrance of the Simele Massacre that began this date in 1933. A Mesopotamian Christian people* whom the past century has hard pressed, Assyrians were in the post-World War I aftermath of the Ottoman Empire angling for some form of a self-governing enclave in the British Mandate, and were highly alarmed at being consigned to the tender mercies of an independent Iraq after 1932. The Assyrian Nation which is temporarily living in Iraq, having placed before their eyes the dark future, and the miserable conditions which are undoubtedly awaiting them in Iraq, after the lifting of the mandate, have unanimously held a Conference with me in Mosul … At the conclusion of lengthy deliberations, it was unanimously decided by all those present that it is quite impossible for us to live in Iraq. WE ARE POSITIVELY SURE THAT IF WE REMAIN IN IRAQ, we shall be exterminated in the course of a few years. WE THEREFORE IMPLORE YOUR MERCY TO TAKE CARE OF US, and arrange our emigration to one of the countries under the rule of one of the Western Nations whom you may deem fit. And should this be impossible, we beg you to request the French Government to accept us in Syria and give us shelter under her responsibility FOR WE CAN NO LONGER LIVE IN IRAQ AND WE SHALL LEAVE. Assyrians have a tragically voluminous register of atrocities endured; the one in question for this date perhaps resonated deeply enough to emblazon the date on the calendar because it ground up Assyrian bodies and national aspirations alike during the formation of the modern Middle East. WE SHALL LEAVE, the petition said; in July 1933, 600-plus Assyrians crossed into French Mandate Syria, seeking asylum. They were refused, and sent back to Iraq — and encountered a hostile Iraqi army unit, resulting in a firefight with 33 Iraqi casualties. Simele was also among the major inspirations for jurist Raphael Lemkin, who later in 1933 — and citing the Assyrian experience as well as the earlier Ottoman slaughter of Armenians — presented to the League of Nations his concept of the Crime of Barbarity. This idea Lemkin would eventually develop into the concept of genocide (he’s the guy who coined the term). * Saddam Hussein‘s ex-Foreign Minister, the late Tariq Aziz, was an Assyrian.